The National Heritage Centre for Horseracing and Sporting Art at Palace House, Newmarket, has achieved Artsmark Partner status in recognition of its commitment to offering and supporting opportunities for a well-rounded cultural education for schools through its education programme. Artsmark Partnership status is awarded by Arts Council England to organisations devoted to bringing arts and cultural opportunities to children and young people, which Palace House’s education programme delivers through its fascinating collection of horse racing and sporting art housed across the centre’s three complementary attractions. Journeying through the National Horseracing Museum in the Trainer’s House and King’s Yard Galleries,enjoying the Packard Galleries of British Sporting Art in Palace House and being inspired by the Retraining of Racehorses charity in the Rothschild Yard, school groups visiting Palace House enjoy stimulating and meaningful learning experiences across a wide range of curriculum linked subjects, ultimately supporting cultural education. 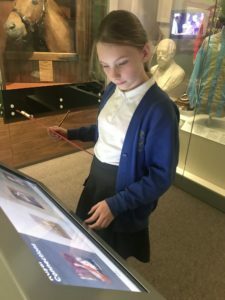 School groups visiting Palace House have the opportunity to enjoy both stimulating self-led visits and the chance to take part in immersive curriculum-linked workshops, providing enriching and enjoyable learning outside the classroom for all ages. Art themed activities see students encouraged to make their own creative and artistic work, inspired by the colourful collections of the Palace House galleries as well as to learn about artists and their work. As well as honing their arts skills, students visiting Palace House can undertake activities and workshops which use the artwork and cultural collections to inform other areas of the curriculum, including Science, Maths and History. This commitment to using arts and culture as a tool to steer cross curricular learning is just one of the reasons for Palace House’s new Artsmark Partner status, helping to support the Artsmark Partnership Programme in its work alongside educational establishments on their journey to embed arts and culture across the curriculum. Alongside being an Artsmark Partner and member of the Artsmark network, Palace House is also proud to be a registered Arts Award centre, where members of the education team can advise and enable young people to achieve their Arts Award; a range of unique qualifications managed by Trinity College London and supported by Arts Council England, that anyone aged up to 25 can undertake as they develop as artists and arts leaders.